Riding a bike is usually a safe knee rehab exercise, helping restore and improve knee joint mobility, stability, flexibility and strength. A recumbent bike has a chair with a backrest and the pedals are in front of you instead of beneath your hips as in a upright bike. Cycling with your feet in front of you changes the direction of the forces that are applied to the knee joint and individuals should consider their knee injuries before riding an upright bike, according to a study led by Raoul F. Reiser II of Colorado State University. Since the knee is the largest joint in the body it is the most easily and commonly injured. The major ligaments, that are often injured, and connect at the knee are the anterior cruciate ligament (ACL), the medial collateral ligament (MCL) and the posterior cruciate ligament (PCL). ACL injuries typically occur when individuals change direction quickly or when landing from a jump. MCL injuries are usually a result from a direct blow to the outside of the knee, while a PCL injury is typically from a blow to the front of the knee. Another common injury at the knee is injury to the meniscus, the soft cartilage found between the bones that provides cushion and absorbs shock. Physicians prescribe knee rehab for these injuries as well as injuries related to overusing the knee joint. The recumbent bike is most beneficial for those with ACL injuries. In a recumbent bike the semi-reclined position redistributes lower body weight, constrains hip movement and provides a firm backrest to push against when riding. Riders also mainly push the pedals when riding a recumbent bike. According to the Colorado State University study, riding a recumbent bike places less stress on the ACL. The study suggests that the range of motion for the knee joint is the same when riding an upright bike or a recumbent bike. The seat moves forward and backward and proper placement is important to reduce the amount of strain on the knee joint. The knee should be slightly bent and hips should not rotate when pedalling. Riding an upright bike will not be prescribed as part of knee rehab until you have a minimum of 100 degrees of knee flexion to complete one full rotation. The saddle height influences the amount of bend in the knee and being too high will place more strain on the ACL and the iliotibial band. Having the saddle too low will cause more strain on the patellofemoral joint. The Cartilage Health website recommends a high saddle during the first few exercise sessions to restore range of motion but says individuals should move the seat down as it becomes easier to go through a full pedal revolution. 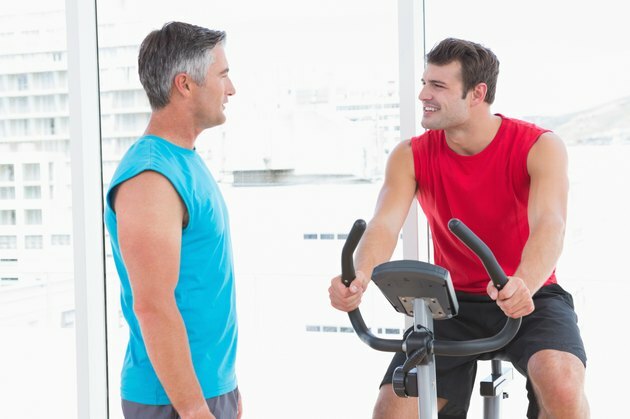 Physicians often prescribe the recumbent bike first to get you used to exercising after a knee injury due to it being easier to use than the upright bike. Riders on an upright bike can be tempted to stand up when riding, placing too much strain on the knee. Individuals should choose the type of bike that they want to ride based on their physician's recommendations, their range of motion at the knee joint, their specific injury, their ability to control intensity and which bike feels more comfortable. Biomed Science Instrument; Knee Loads in the Standard and Recumbent Cycling Positions; Raoul F. Reiser II, et al. Can I Use a Treadmill After Knee Surgery?